Last summer, this blogger posted a graph showing the path followed by U.S. long-term interest rates since 1925. There has been some interest in a new and updated graph, especially in light of concerns that bond markets might soon demand higher yields as the economy expanded. One appears above. Reasons for apprehension about a possible jump in yields vary and include large federal deficits, which increase the amount of bonds that must be absorbed by the market, as well as concerns about a possible resurgence of inflation driven by quantitative easing (QE) and a near-zero Federal Funds rate. The Financial Times [homepage link] and some other newspapers have been reporting recently on a perhaps greater threat to price stability worldwide: a continuing run-up in the prices of some key agricultural commodities, brought about mostly by factors other than macroeconomic policy. 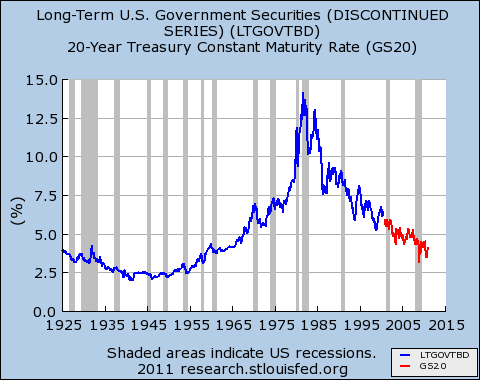 There has been some discussion of rising yields for long-term government bonds, but the long-term perspective offered by the figure above shows that interest rates remain very low by historical standards, at least for now. Moreover, real yields on federal inflation-indexed securities remain quite low indeed, and in some cases negative, as shown, for example, by the green line in the figure below. Broadly speaking, such yields are what markets expect certain inflation-protected bonds to yield in addition to compensation for inflation. Hence, they can be viewed as indicators of the costs of borrowing after expected inflation is taken into account. These costs have apparently been trending downward since 2008. (Some related but different interest rate series remain in positive territory, including for example one type of ten-year inflation-indexed bond issued early last year, which is yielding a little over .8 percent. By the way, the red line in the graph below shows only the most recent data points from the figure at the top of this post. 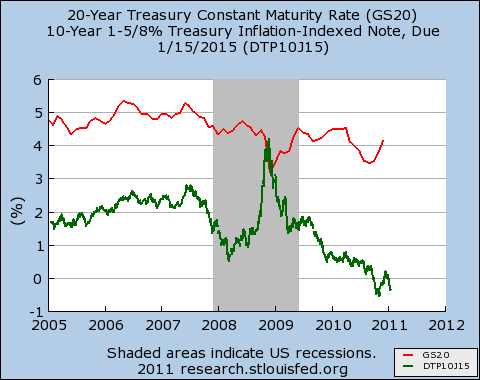 This longer-term nominal rate is not comparable to the inflation-indexed series depicted by the other line.) These data show that recent Fed efforts to ease the terms on which money can be borrowed in a time of large deficits have continued to prove efficacious in a way that many economists find puzzling, though it is unlikely that these monetary policy actions alone will have a large impact on the rate of economic growth. The Economic Policy Institute has produced an interesting analysis on jobs lost and recovered in U.S. post-war recessions. 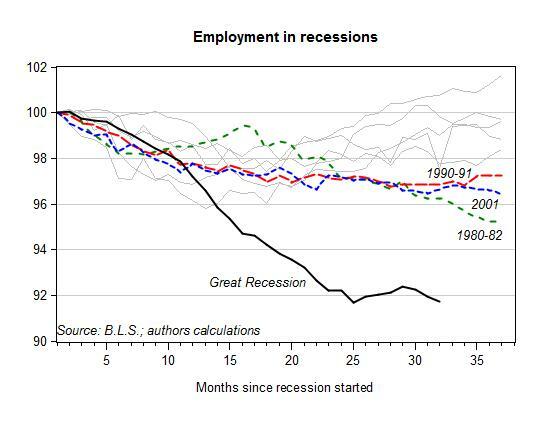 They show how many months were needed, since the beginning of a recession, to get back to the initial employment level. However, the working population is growing over time, so getting back to the employment level of, say, 12 months ago, would not be sufficient to restore the same employment and unemployment rates. In our chart we assume that population grows at its annual average (around 1.4 percent), and calculate how long it took for employment to get “back on track”, i.e. we compare actual employment with what employment should have been, if jobs grew along with active population. 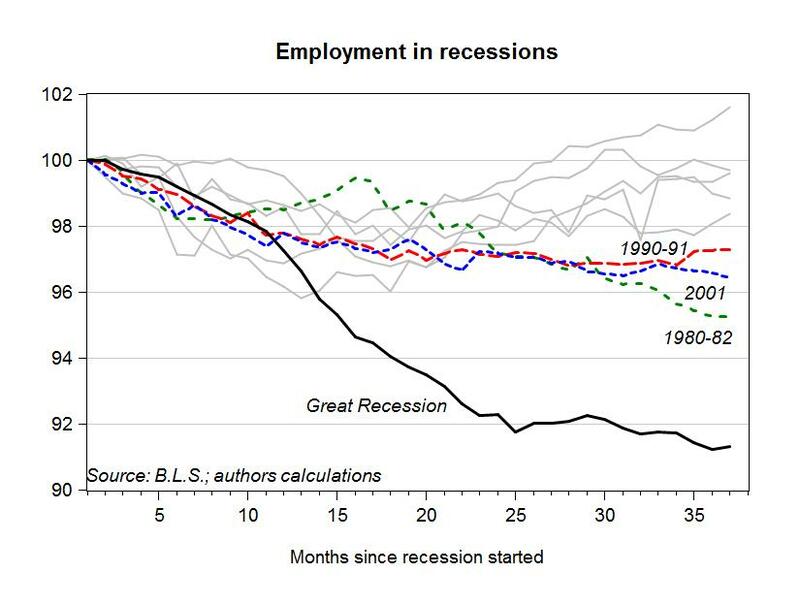 With our modified chart, employment got back on track within three years only in the recession which started in 1969. In all other cases, employment was still below its pre-recession path after three years. At the last meeting of the American Economic Association in Denver, Giuseppe Fontana discussed the theoretical arguments on whether the Great Recession will generate a permanent loss in output. He argued that, according to the dominant “New Consensus” theory, output should return to its historical path once the shock has been absorbed. Alternative, heterodox theories, suggest that the shock will have permanent effects. 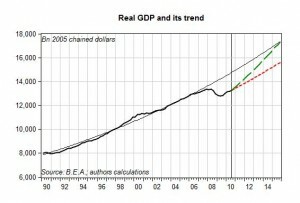 In the chart we plot U.S. real GDP along with its trend, estimated using a simple exponential function over the pre-recession period (from 1970 to 2007). The average growth rate in output over this period was slightly above 3 percent. 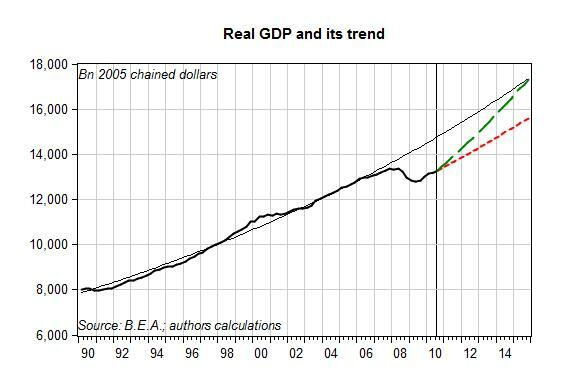 The dotted red line plots the evolution of GDP, should it resume its average, pre-recession, growth rate. The red line therefore represents the idea that the recession will have permanent effects. The green dashed line has been drawn under the assumption that the economy gets back to its pre-recession growth path by the end of 2015.